Overall, the new report is full of good news for the region. A total of 169,950 new jobs have been added since the depth of the recession, over 100,000 more than the jobs that were lost. But, as McDonough says, a closer look at cities in the seven-county Portland-Vancouver region shows disparities. The economy in the Portland region is growing faster than most of the rest of the county, with both jobs and incomes increasing more than practically all other metropolitan areas. But the benefits are not being spread evenly across the region. Although inner Portland is doing well, pockets of poverty exist in the outlying regions, especially in Clackamas and East Multnomah counties. Minorities still earn far less than whites on average. And even those with good paying jobs are being squeezed by rising home costs. Those are among the findings of the sixth "Check-up on the Portland-Region's Economic Health" released by the Value of Jobs coalition last week. The annual reports were started to track the regional economy as it was beginning to recover from the Great Recession by business groups in the area. "Portland cannot sit back and be happy and saying things are going pretty well here. We need to look at the health of the entire region, and there are concentrations of poverty that must be addressed," says Sandra McDonough, president and CEO of the Portland Business Alliance, which participates in the coalition. The report was prepared by the ECONorthwest consulting firm. It compares the Portland region to two sets of other metropolitan areas. The peers are Cincinnati, Sacramento, Salt Lake City and St. Louis. Aspirational ones — those that have historically done better than Portland — are Denver, Minneapolis and Seattle. Overall, the new report is full of good news for the region. A total of 169,950 new jobs have been added since the depth of the recession, over 100,000 more than the jobs that were lost. And the numbers are still growing at a faster rate than in the peer cities of Cincinnati, Sacramento and St. Louis. Jobs are even increasing at a faster rate than in the aspirational city of Minneapolis, even though the are beginning to level off. Earnings are also increasing at a faster rate than most of the peer and aspirational cities. The median household income in the Portland region was $63,850 last year, 5.9 percent higher than in 2015. That's more than all peer cities except Salt Lake City, and the rate of increase beat every one of them. "By a number of economic measures, Portland-metro's regional economy continued to rebound in 2016. A growing economy, increasing jobs and wages and high productivity are significant strengths," says the report, which found the great job growth in the professional, business services, education and health services sectors of the economy, compared to last year. McDonough says Portland is doing so well, it may time to begin considering Denver, Minneapolis and Seattle as its peer cities. "We're more like the big guys now," McDonough says. Racial disparities also exist. Asians and whites earn far more than Hispanics and African-Americans. And although the median household income has increased for everyone else since 2015, for African-Americans, it has fallen 9 percent from 2005 levels and has been flat for the last three years. "Communities of color are not equitably sharing in the region's growing prosperity. As Portland-metro continues to grow and become more diverse, ensuring widely available opportunities for all residents will be critical for the region to thrive," the report says. Despite the overall increase in jobs and income, Portland is not nearly as affordable as many other cities. That is because the cost of living here is higher than it is in all of the peer and aspirational cities. "In terms of affordability, what a salary will actually buy, we're the least affordable of the other regions," says McDonough. That is largely because of two factors. One is housing costs. Rents and home prices have been rising faster in the Portland area than practically anywhere else in the county. According to the report, only households earning 100 percent of the median family income can now afford to rent a one-bedroom apartment in Portland. Households have to earn more than 60 percent to afford them in Beaverton and Gresham. And homes for sale are so limited that biddings wars are commonplace, pushing their final prices well above the original listings. "The issue of housing affordability must be addressed. Portland-metro must make it a top priority to increase the supply of housing for all income levels. We must ensure adequate land supply for housing growth and a regulatory regime that encourages housing development across the region," says the report. The other is a shortage of middle income jobs being created. The report says most new jobs in the region are either at the upper or lower ends of the pay scale. Traditional family-wage jobs are still in short supply. "Growing and maintaining quality family-wage jobs must remain a top priority, even as the regional economy appears to be booming. Every resident must have access to quality jobs, and the region must address obstacles that block many from access to greater economic opportunity, whether it is educational outcomes, workforce training, hiring practices or other factors," the report says. In the Oregon part of the region, affordability is even more of a problem outside of inner Portland, Hillsboro, Beaverton and Wilsonville. According to the report, many people living on the edges and outside those cities are vulnerable to displacement — meaning they at risk of being pushed even farther away from employment centers, something that has already happened to many families. That determination was made using census data that includes such indicators as the percent of those without bachelor's degrees, the percent of households below 80 percent of the median family income, the percent of homeowner and the percent of non-white population. 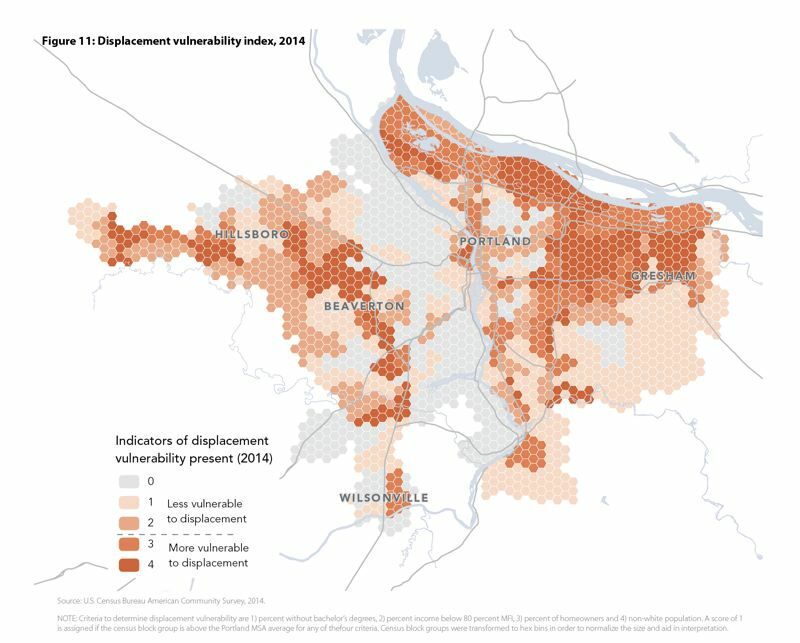 "Household displacement is rising across the region except for gentrified areas in inner Portland. Failure to address these interregional affordability challenges may impact economic mobility and opportunity, stressing the region's infrastructure as households move farther from job centers and the city core," says the report. Despite the problems, the report says that because of its improving economy, Portland has moved up the rankings in the prestigious category of "Knowledge Capitals" compiled by the well respected Brookings Institute. It ranks 19 cites around the world identified as hubs of innovation where value is measured not only in productivity, but in ideas, advancements and investment. Portland is ranked 9th overall on the list which includes such as recognized leaders as San Francisco, Stockholm and Zurich. In fact, Portland came in number one in terms annual average real Gross Domestic Produce growth per worker between 2000 and 2015 — and number two in terms of overall GDP growth, just behind Austin. "Leaders and decision makers must stay focused on protecting and growing jobs while addressing critical issues like housing supply and affordability. It all works together. As Portland begins to look more and more like a major U.S. metro, it is urgent that we work on these issues as a community," the report says. Other members of the coalition include Associated Oregon Industries, Greater Portland, the Oregon Business Association, the Oregon Business Council, and the Portland of Portland. You can read the full report at http://valueofjobs.com/economic_health_2016/index.html. The number of new jobs added in Portland-metro from September 2015 to September 2016. The number of new construction jobs added in Portland-metro between September 2015 and September 2016. The national ranking of Portland-metro's gross metropolitan product growth among the top 100 U.S. metros from 2014 to 2015. The percentage which Portland-metro's median household income grew in 2015, outpacing all peer and aspirational regions in annual growth. The percentage that 2015 real median household income in Portland-metro compares to 2008 levels. The average monthly cost of a one-bedroom apartment in Portland; exceeding 100 percent of median family income for the region (plus utility expenses). 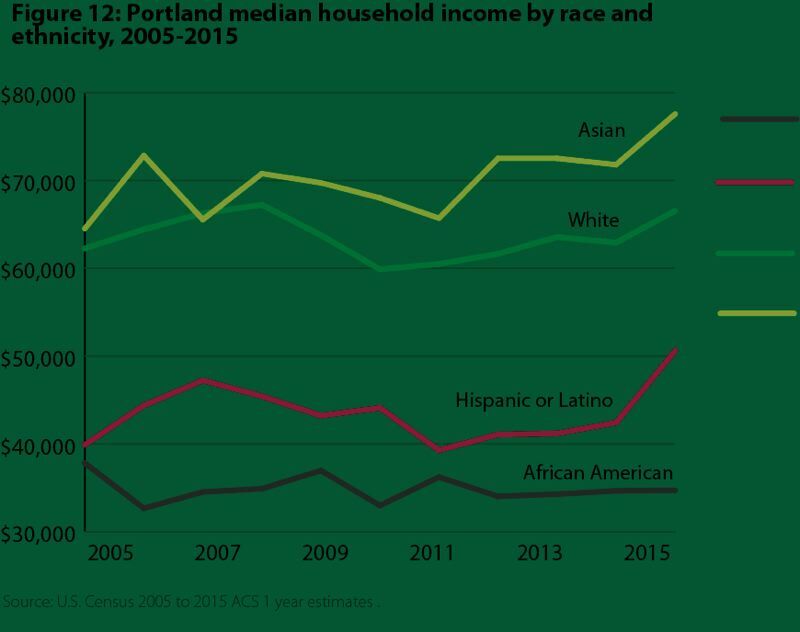 The percentage that 2015 real median household incomes in Portland have decreased from 2005 levels for African Americans.